Economic growth in the resource-rich Brazil continues to remain under pressure due to a combination of a credit crunch, rising interest rates and weakening demand. 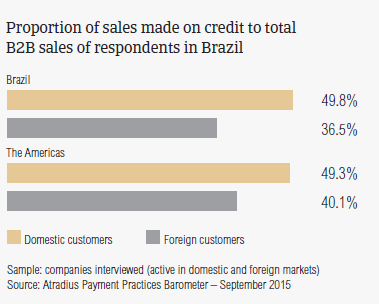 95.6% of the survey respondents in Brazil reported having offered trade credit terms in either their domestic or international B2B transactions over the past year. This is the highest percentage of respondents citing the use of this business practice across the countries surveyed in the Americas (Canada, Mexico and the US). Consistent with the survey pattern, Brazilian respondents appear to be markedly more inclined to sell on credit to B2B customers domestically than abroad. Domestically, credit-based sales averaged 49.8% of the total value of the sales to B2B customers in the country (average for the Americas is 49.3% and for Europe 44.3%). In contrast, respondents’ foreign sales made on credit averaged 36.5% of the total value of their exports (average for the Americas 40.1% and for Europe 37.9%). The discrepancy between the domestic and the foreign proportions of credit sales in Brazil is the largest of the countries surveyed. This suggests that on average, respondents have the least uniform perception of payment default risks arising from domestic and foreign trade. Over the past year, the average proportion of sales on credit to domestic and foreign B2B customers transacted on credit in Brazil dropped slightly, by an average of nearly 3 percentage points, which is lower than the average 5.7 percentage point drop recorded in the Americas. This is the slightest drop in the value of B2B credit-based sales of all the countries surveyed in the Americas, which suggests a notably lower propensity of Brazilian respondents to use payment methods other than trade credit in B2B transactions compared to other countries surveyed. Domestic B2B customers of respondents in Brazil are given payment terms (averaging 32 days) which are slightly shorter than those extended to customers abroad (averaging 35 days). This characteristic, which is shared with Mexico, is the opposite of what was observed in the US and Canada. The average payment terms in Brazil are well above the average term for the Americas, which is 28 days for both domestic and foreign B2B customers. Compared to the same survey period one year ago, the domestic average payment term in Brazil appears to be slightly longer (by an average of three days). Similarly, payment terms extended to foreign B2B customers increased since last year, and is currently averages five days longer than last year. Economic growth in the resource-rich Brazil has continued to remain under pressure due to a number of factors ranging from declining competitiveness, weakening demand from China and falling commodity prices. As a result, Brazil is likely to see a deterioration of its insolvency environment this year, as financial conditions tighten and the economy contracts. The warning signs are already there, as 95% of the survey respondents in Brazil reported having experienced invoice late payment from their B2B customers (respondents in the Americas 94.7 and in Europe: 92.8%). This is the second highest percentage of respondents reporting this experience across the countries surveyed, after Mexico. 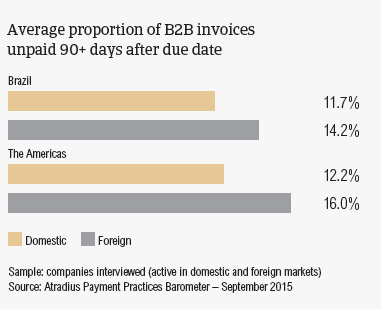 In terms of frequency, late payment from domestic B2B customers occurred almost as often as that from customers abroad. By value, on average, 43.8% of the total value of domestic B2B invoices in Brazil remained unpaid after the due date (the average for the Americas is 46.1% and for Europe is 40.1%). This percentage is close to that recorded in the US (46.6%), is notably lower than that in Mexico (54.2%) and markedly higher than that in Canada (36.9%). Over the past two years, the levels of overdue domestic payments in Brazil increased by around 14 percentage points. This is in line with the upward trend observed in the Americas, where an increase averaging around 13 percentage points was observed. 44.3% of the average total value of foreign B2B receivables went past due. This proportion, which is almost the same as in Canada, and notably lower than in Mexico and the US, is below the 49.1% average for the Americas (average for Europe: 35.1%). Over the past two years, the rate of foreign overdue payments in Brazil increased significantly, peaking at a nearly 14 percentage points difference from the level recorded in 2013. However, this sits below the average increase for the survey overall (19.6 percentage points). Although nearly three-fifths of the overdue invoices in Brazil were paid within one month after the due date, the proportion of long outstanding receivables (unpaid after 90 days overdue) appeared quite sizeable. 11.7% of the total value of the domestic, and 14.2% of the total value of the foreign B2B invoices was reported to be still outstanding after 90 days past due (averages for the Americas: 12.2% domestic and 16% foreign. Europe: 7.6% domestic and 7% foreign). This is reflected in the Days Sales Outstanding (DSO) figure posted by Brazilian respondents, which averages 29 days and is the second longest figure across the countries surveyed after Mexico. However it does not appear to differ significantly from the survey average. In Brazil, domestic B2B customers make their past due payments, on average, not later than one month after the due date. Foreign past due invoices are paid by customers almost within the same time frame (an average of 32 days past due). Both figures are in line with the survey averages. This means that B2B suppliers in Brazil receive payment on domestic B2B invoices around 60 days after invoicing, and on foreign invoices after about 67 days . Last year, there was a marked decrease in both the average domestic and foreign payment delay figure in Brazil, followed by an increase this year, which brought the rate of domestic and foreign late payment to levels higher than in 2013. Carrying past due receivables implies financial and administrative costs, which may have a significant impact on cash flow and profit levels. Consistent with the survey pattern, most of the respondents in Brazil (23.9%, versus 20.3% for the Americas) reported that cost containment is the biggest challenge to business profitability this year. Above the survey average is also the percentage of Brazilian respondents (19% versus 16.1% for the Americas) who are finding maintaining adequate cash flow levels challenging this year. This would suggest that respondents in Brazil anticipate increasing insolvency levels this year. The majority of respondents in Brazil (four in nine) indicated that late payment from domestic B2B customers is mainly due to liquidity issues. This quite sizeable percentage, which points again to the country’s challenging economic conditions, is slightly below the 46.4% average recorded in the Americas. Well above the 23.6% survey average is the 30.2% percentage of Brazilian respondents stating that inefficiencies of the banking system is the primary reason for late payment on domestic B2B sales. At the same time, inefficiencies of the banking system are reported to be most often the reason for payment delay from B2B customers abroad (32% of respondents, versus 37.2% for the region). Nearly one third of the respondents stated that late payment of foreign B2B invoices is most frequently attributable to the customer’s liquidity constraints, and to the use of trade credit by the customers as a means of alternatively financing their business operations. The proportion of B2B receivables, reported by Brazilian respondents as uncollectable averages 2.5% of the total credit sales value in the country. This is almost in line with the survey average of 2.2%. Consistent with the survey pattern, domestic write-offs outweigh foreign ones. This may be explained by the relatively lower volume of foreign credit-based transactions than domestic ones across the countries surveyed. Domestic and foreign uncollectable B2B receivables are primarily reported from the construction, consumer durables, electronics and business services sectors. For most of the respondents in Brazil (51.2%) compared to 54.6% in the Americas, B2B receivables were mainly due to the customer being bankrupt or out of business. Failure of collection attempts were reported by fewer respondents in Brazil (35.5%) than in the Americas (37.2%). This may explain why respondents in Brazil (8.8%) appear to be much less concerned about collections of outstanding invoices than their peers in the Americas (12.1%). The aging of the trade debt, as well as the circumstance that the customer could no longer be located, were the most frequent reasons for receivables to be uncollectable according to nearly one third of the respondents in Brazil. Domestic and foreign B2B customers in the construction sector generate the highest levels of overdue payments (around 57%). 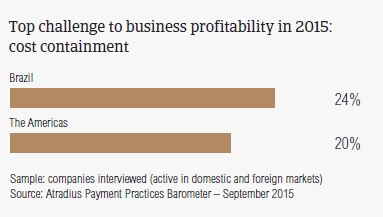 Domestic payment delays are below the survey average only in the services sector. This is the case for foreign payment delays in the food sector. Liquidity constraints was the most often reported reason for domestic payment delays in the chemicals sector (three in five respondents). Conversely, domestic buyers in the consumer durables sector (36% of respondents) delay invoice payment most often due to inefficiencies of the banking system. This, along with claimed liquidity issues and the use of trade credit as an alternative means of financing, are the most often reported reasons for late payment on foreign invoices in the services sector. Around one in five respondents in Brazil said that they do not expect any change in the payment behaviour of either domestic or foreign B2B customers over the coming 12 months, Nearly one third of the respondents anticipate a worsening, particularly in the construction and consumer durables sectors, and just over two in five respondents envisage an improvement in B2B customers’ payment patterns specifically in the domestic transport sector. The ICT sector has seen a decline due to the economic downturn in Brazil, with decreasing demand, exchange rate volatility and high interest rates. The Brazilian economy is expected to grow only 0.3% in 2015 after 0.2% in 2014, as the much needed return to more orthodox economic policies will negatively weigh on growth in the short-term.